c. 1315-1325, 400 x 290mm. The epic tales of King Arthur’s court, of chivalry, courtly love and the quest for the Holy Grail are some of the most captivating and poignant of all European fiction. Though their origin is in Celtic legend, perhaps based on the historical figure of a warrior king of the British who fought valiantly against invaders in the sixth century, the stories were first popularised in Northern France and at the Angevin court of Henry II and Eleanor of Aquitaine. The original poetic format of Wace and Chretien de Troyes was re-worked into prose, a medium previously used almost exclusively for instruction on religious subjects. Here it was adapted for the purpose of entertainment and so the first great work of French prose fiction was created. The universal themes and motifs provided models for vernacular literature not only in French and English, but throughout Western Europe, and continue to be translated and adapted today. 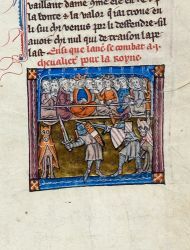 Building on the tradition of the Southern troubadours, whose epic tales of bravery and glory on the battlefield appealed to the French warrior classes, the courtly romances were aimed at a more refined, aristocratic audience in the mid twelfth century, who identified with the courtly values of King Arthur and his knights. Towards the end of the century the legends were christianised as the quest for the Holy Grail became one of the central themes and the knights evolved into soldiers of Christ. It is difficult to quantify the impact of Arthurian literature on European culture, but undoubtedly concepts such as gentlemanly behaviour and the quest for perfection were popularised through them. The British Library has the largest collection of Arthurian manuscripts in England, with over 40 out of just over 500 that survive worldwide. They range from large, beautifully-illuminated volumes commissioned by princes or aristocrats (for example Royal 20 D. iv) to small, plain volumes made for lesser patrons (for example Lansdowne 757). Some were copied and owned in England in the Middle Ages, others were acquired by collectors at a later date. A significant number are in the Royal collection, the manuscripts owned by the Kings of England and bequeathed to the British Library by George II in 1757.